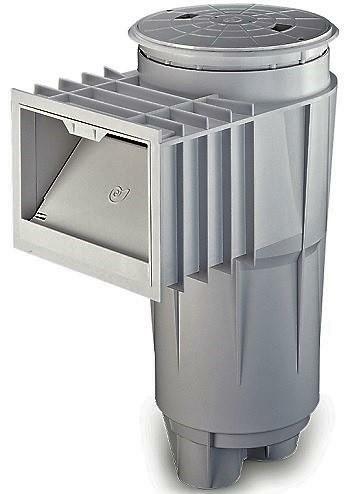 The low profile design of SwimquipR is ideal for new and retrofit installations. Available in white, gray and tan, with models for both concrete and vinyl pools. This is the most popular replacement to yhe discontinued Jacuzzi PMT Skimmer. Admiral™ S15 skimmers offer a variety of bases and throats for a wide variety of plumbing and construction requirements, configurations and materials. These skimmers have an exclusive lock-down lid that can be personalized with custom logo disks. S15 skimmers are injection molded of high strength ABS and are available with a flap weir for superior skimming action. 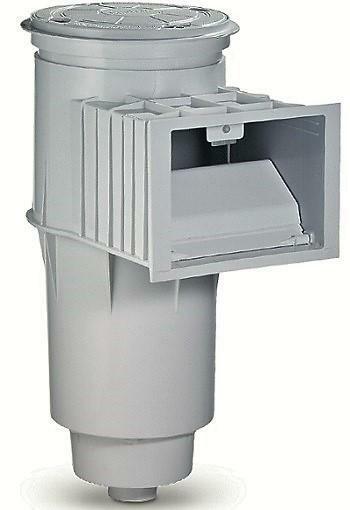 Admiral™ S20 skimmers have a PVC reinforced twin port base. S20 may be purchased with equalizer for commercial and NSF applications or for when the second port is connected to the main drain. Bermuda Skimmers feature a heavy-duty one-piece construction with sturdy external ribbing for superior strength. All Bermuda Skimmers for vinyl liner and fiberglass pools are made from ABS plastic. Choose among the following configurations: • ABS or PVC • White, black and tan colors available • 1-1/2 in. or 2 in. slip or threaded ports • Optional equalizer valve. SDX2 boasts a flow rating of 188 gpm on the floor and 154 gpm on the wall. SDX2 has a 1.396 feet per second velocity at the opening at a maximum listed 188 gpm. Paramount drains are compliant with the Virginia Graeme Baker Act 2008. SDX2 protects against all five types of entrapment; hair, limb, body suction, evisceration, and mechanical entrapment. Hayward covers safety with variety and style including 9" x 9", 12" x 12", 18" x 18", including Low and High Flow opptions. New safety suction outlets meet all federal requirements. 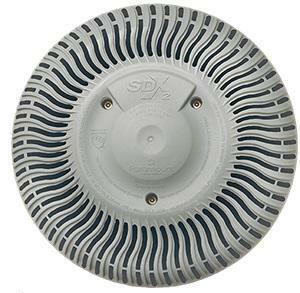 For concrete or vinyl/fiberglass pools, Hayward industry approved suction outlets and covers are available in a wide range of styles, sizes and colors to satisfy any installation requirement. These drain sump covers are unblockable and are qualified “Field Fabricated Outlets,”, which can be used with existing pool outlets (drains). However, these drain covers are not intended for pools with single main drains, except in special cases. 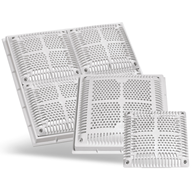 Natare certified VGB drain covers and sump grates are available in standard sizes for 18-in. x 18-in. or smaller drain openings, and 24-in. x 24-in. or smaller drain openings. 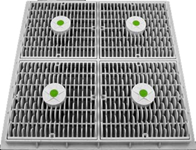 These sump grates are available in stainless steel or our special GPM polymer. Custom sizes can be supplied to accommodate virtually any existing drain sump or outlet. 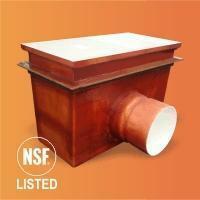 Super strong PVC material sump does not require transitional glue. 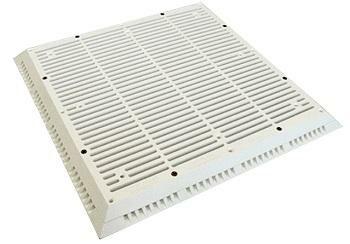 Varity of Grating options to suit your waterflow needs. The AquaStar line of suction outlet covers compliant with the VGB US Standards. Grate covers come in a variety of colours in sizes from 8” round to 24” x 24” square for use in both new construction and retrofit. Also available are several different styles of channel drains for wall or floor applications. Lawson Aquatics specializes in larger custom sized sumps 18"x36", 18"x72" ect. If you are looking for something out of the ordinary give us a call and we can help you out.